If you're the type of user that works with open web browsers, email clients, instances of Windows explorer, FreeCell, MS Word, and others, all at the same time, then you need a utility that allows you to quickly switch between programs with the mouse or via hotkeys. 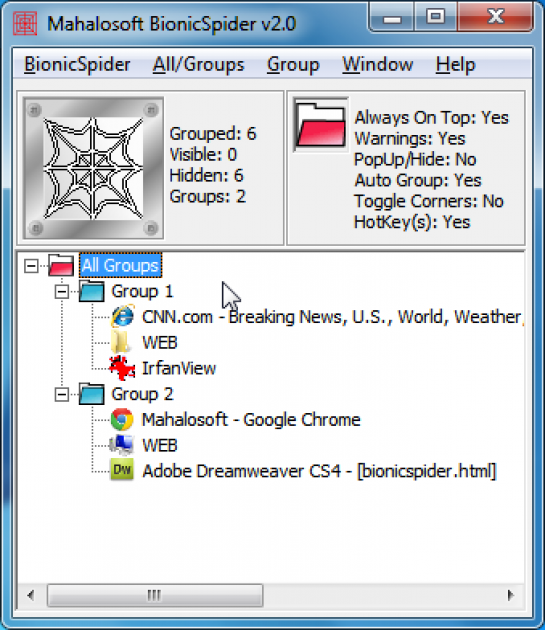 Bionicspider, an efficient window organizer, (download here), can help you manage the chaos that comes from having too many opened application windows on your desktop. Bionicspider is very easy to use and has many options to help with multi-tasking. One of the best ways to use Bionicspider is by creating Groups to organize your windows and switching between them via the hotkey settings. For example, you might create an "Internet Group", placing your open web browser and email client in it, and then you might create a "Work Group" where you'll put Microsoft Word and Excel in, and then a "Game Group" and so on. First off, make your Group folders by left clicking on the top red Group and selecting "Add Group". Make as many Group folders as you like. Next, open all your program windows and organize them in their respective Groups by dragging and dropping them. Attach a hotkey combo to each Group for fast switching by going into the Bionicspider menu and choosing "Hotkeys". Inside the hotkey dialog box, select each Group, click the "Enable" button, press a hotkey combo (for example, Ctrl+Shift+F1), and click the "Set HotKey" button to save your new Group hotkey. Repeat this process for all your Groups. Now you'll be able to switch to each window Group by firing off its respective hotkey. When switching to a Group, all other Groups will be hidden, and the current Group will become visible, showing all its windows that it contains. Bionicspider is a neat little program that takes charge of all your opened windows and organizes them into Groups that you can quickly switch to via mouse or hotkey combination. If you multi-task like a pro and need some order for all your opened application windows, give Bionicspider a try today.